Together with Yiwei Gong and John Bertot, I edited a special issue for Government Information Quarterly on agile government. For our introduction, we conducted a systematic literature review of articles published on the subject during the last decades and provided guidance for future research. In this article, we synthesize this literature, provide an outlook on future research questions, and introduce several articles as part of the current special issue focused on agile government. Hong and Lee’s (2018) article provides evidence of how regulation and decentralization impacts adaptive governance. The authors argue that decentralization of governance can hinder the process of adaptation in the sharing economy, especially if the considered policy embodies entrepreneurial politics. Wang, Medaglia, and Zheng’s (2018) article investigates adaptive governance in the context of digital government where new forms of collaborative governance are needed to rapidly adapt to changes in the internal and external environments. Soe and Drechsler (2018) discuss how local governments collaborate for joint service provision, be more adaptive toward new technological and organizational changes, and introduce innovative services following industry trends such as predictive analytics, autonomous vehicles, and artificial intelligence. Chatfield and Reddick (2018) show how a U.S. city government’s use of big data analytics enhances customer agility in 311 on-demand services. Reference: Mergel, I., Gong, Y., Bertot, J. (2018): Agile government: Systematic literature review and future research, in: Government Information Quarterly, 35(2):291-298. A digital agency for Germany? Good idea – if you do it right! The Grand Coalition wants to make Germany a digital country and reform the public administration. A few suggestions on how this could be achieved. The coalition agreement negotiated between the CDU/CSU and the SPD provides for an e-government or digital agency. We want to develop our country into a strong digital country in all areas,”the coalition agreement states. But what exactly could this mean? Germany has no experience with digital agencies. This makes it all the more important to look at examples of this kind abroad. A look at Denmark, Great Britain or the USA shows that if a digital agency is set up correctly, it can rapidly advance the digital transformation of public administration, create common standards at all administrative levels, reduce bureaucracy and bring it closer to the citizens. Essentially, we are talking about new online services that are easy to use for everyone, similar to those we are all used to in our private lives, for example when we shop online or use social networks. In Europe, Denmark has already set up a digitisation agency in the Ministry of Finance in 2011, which prepares digital solutions together with citizens, tests them on a wide scale and makes them available to all levels of government. Especially in Anglo-American countries, digital agencies have already established themselves as an important instrument for modernizing administration. In Great Britain, the digital agency Government Digital Service (GDS) was founded seven years ago. It involves designers, software developers, administrators and citizens from the outset in the design of digital services for public administration to ensure a high degree of acceptance and usability. In the United States, two teams were formed under President Obama following the crash of the HealthCare. gov website: First of all, the U. S. Digital Service (USDS), which was initially created as a so-called fire brigade team and then assigned to the White House as a staff unit. Later, 18F joined the team, which provides advice and support to the public administration to develop digital services from a user’s point of view. Since then, digital agencies have been established in Canada, Australia, New Zealand and Italy, following the example of GDS, USDS and 18F. What they all have in common is that they are directly assigned to the highest level of government. The management teams of the agencies – mostly at State Secretary level – were recruited mainly from the private sector, from Amazon, for example, from Pixar, Google, Guardian. Only in Denmark did the agency emerge from the administration. The digital agencies have extensive budgets for administrative projects, be it online payment systems or the introduction of electronic ID cards, but also for the modernisation of internal administrative processes. Digital agencies have the freedom to work experimentally, similar to start-ups, in order to quickly gain insight into how online services of the administration must be designed to be accepted by citizens. This also includes reducing bureaucracy by rethinking existing administrative processes. In addition, digital agencies have the task not only of developing standards but also of ensuring that they are adhered to. Their “digital service standards” are valid guidelines for all other authorities and ministries. If they do not meet these standards, the work on services is interrupted and some budgets are frozen. What are the advantages of digital agencies? In a decentralised bureaucracy like in Germany, the urgent question arises as to whether the wheel really must be reinvented for every administrative level or whether once designed administrative systems can be replicated at other levels. As a result, costs can be saved and the interaction with public administration will look the same to citizens everywhere, increasing user-friendliness. Italy and Great Britain are already doing so: they offer once developed online services centrally and make them available to all levels of government. This even saves taxpayers’ money. In Germany, public administration is currently working on the introduction of the e-file: the physical file is to be abolished, all documents are scanned, processes are being digitalised. Citizens’ accounts should be set up for citizens, so that everyone only has to enter their data once and can then be shared with other authorities. For many administrators, this changes the familiar and learned work steps. It would therefore be important to change the way the public administration functions in these processes of change. Following the model of digital agencies, agile working methods should be introduced, involving administrators and citizens rather than remaining passive users. Digitalization is a major challenge for managers and employees in administration. They have to continue their training and learn many new processes. Wherever necessary, even new job profiles have to be created or external competences must be used. In any case, it is important that a “digital mindset” is created in the administration – the inner attitude, that it goes without saying that administrative services are automated. Such fundamentally new forms of organisation and work in public administration need role models. Before setting up its own digital agency, the Canadian government had talks with existing digital agencies abroad in order to avoid mistakes once made and to be able to take its own Canadian route. A digital agency needs financial resources that allow it to build up personnel capacity for new forms of work. Internally, teams need the freedom to experiment, to rethink administrative processes from the user’s point of view and to develop a start-up culture so that change processes can be initiated. They need political support and wide-ranging powers of command to support radical changes in the German administrative landscape. The coalition agreement is in place, the Grand Coalition, as we have known since the weekend. The federal and state governments must act now, the priorities are as follows: (1) The Federal Government should support experts – including experts from abroad or with experience abroad – in developing the concept of the digital agency. (2) As has already been done in some administrations, Germany should strengthen its digital administrative capacity. This includes expanding the digital skills of administrative staff and, above all, managers. (3) The digital agency must be endowed with cross-departmental powers and an appropriate budget in order to develop basic components of digital management in-house and then make them available to all levels of management. Then, but only then can the idea of a digital agency become a success story. Ines Mergel is Professor of Public Administration at the University of Konstanz. You can reach them by e-mail or on Twitter. This article was published as a guest post on the blog of Jan-Martin Wiarda on 6.3.2018. The Public Management Review has published a special issue on “Digital Government and Public Management”. 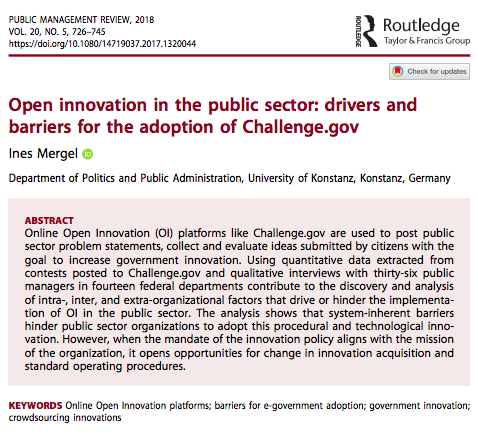 I contributed an article on “Open innovation in the public sector: drivers and barriers for the adoption of Challenge.gov”. The journal has made 50 eprints available for free. Online Open Innovation (OI) platforms like Challenge.gov are used to post public sector problem statements, collect and evaluate ideas submitted by citizens with the goal to increase government innovation. Using quantitative data extracted from contests posted to Challenge.gov and qualitative interviews with thirty-six public managers in fourteen federal departments contribute to the discovery and analysis of intra-, inter, and extra-organizational factors that drive or hinder the implementation of OI in the public sector. The analysis shows that system-inherent barriers hinder public sector organizations to adopt this procedural and technological innovation. However, when the mandate of the innovation policy aligns with the mission of the organization, it opens opportunities for change in innovation acquisition and standard operating procedures. Imagine a toy manufacturer that lets children decide on the design of its new products. For instance, the company might seek the children’s input on the desired components of a new toy pirate ship using an online platform. Professor Mergel believes that this could be a blueprint for the digital transformation of public administrations. Citizens should have a say especially in the digitisation of external public services. This kind of collaboration between authorities and users is called co-creation. The concept is currently being studied by the EU project cooperation “Co-VAL”. 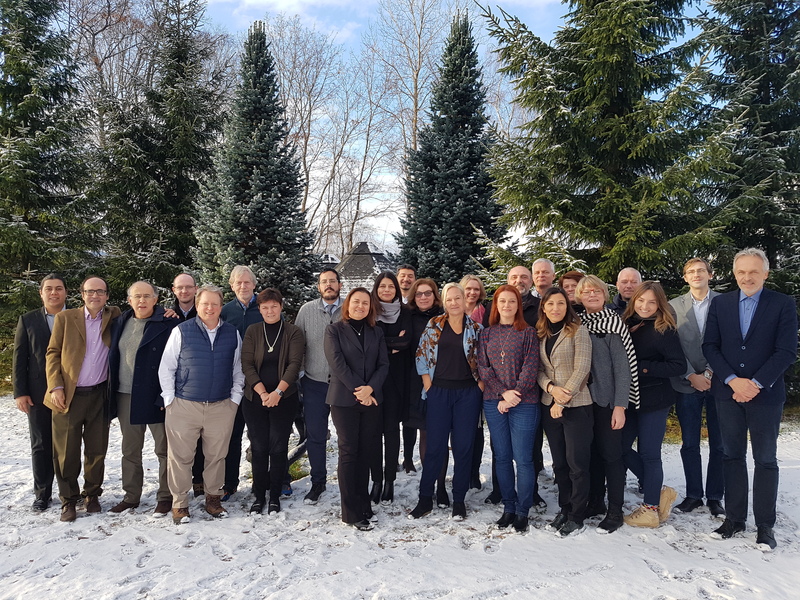 Ines Mergel’s team is one of twelve research groups from eleven European countries that are being funded with 4.1 million euros in the context of the EU funding programme “Horizon 2020”. The Co-VAL project is coordinated by the Athens Technology Center SA (Greece). The aim is to provide policy recommendations for transformative strategies that integrate the co-creation of value in public administrations. “Co-Production of Public Value” – Co-VAL – means that the public sector works closely with the users, i.e. the citizens, to develop digital formats or entirely new digital services. Ines Mergel believes that existing e-government services in Germany are not particularly user-friendly, which could explain why users have, by and large, chosen to steer clear and rarely accept digital services provided by public administrations. One example is the digital national ID card, which is hardly being used because it fails to address citizens’ actual needs. 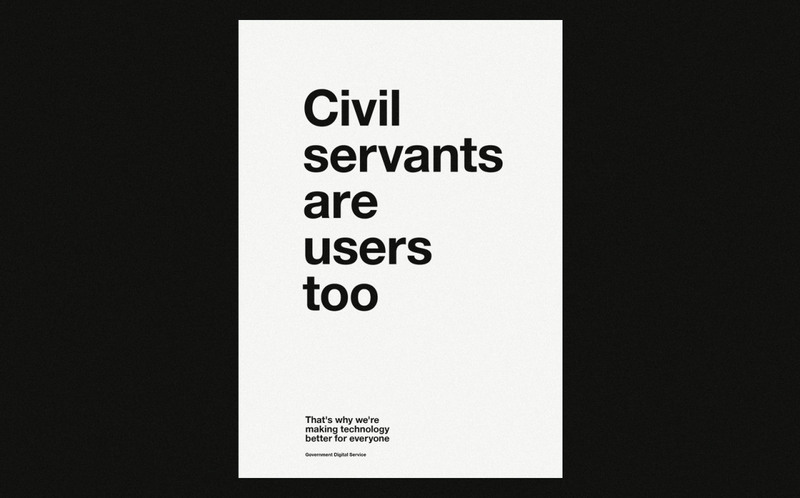 “The government’s online services must be tailored to reflect citizens’ use and search behaviour. Accessing information must become easier”, says Ines Mergel. To achieve this, she wants to actively involve the users. 380,000 euros from the overall Co-VAL funding amount have been set aside for her team to carry out research on the digital transformation of public administration. The first part of the project, a systematic literature review, has already been concluded. Currently, the team is in the process of conducting interviews with public and private sector experts from across Europe and the United States. Building on these interviews, Ines Mergel and her team are identifying concrete and on-going transformation processes and, as a result, potential approaches to and opportunities for co-creation. The next step the international research team will take will be to create a theoretical framework for these transformative processes. “We plan to extract knowledge from practical contexts, synthesize and analyze it systematically and feed our insights back into administrative practice”, explains Ines Mergel. The research results will then be harmonised with the objectives of the “Tallinn Declaration on E-Government” signed by all EU and EFTA states. On November 1, 2017, our new EU Horizon 2020 project titled “Understanding value co-creation in public services for transforming European public administrations“. The University of Konstanz’ working package focuses on digital transformation of public administrations and will start with a systematic literature review of the existing literature. From there, an interview guideline is derived that will be used in 2018 to consult experts in the public and private sector to identify value creation potential through co-design approaches. The interviews will lead the international research team to specific cases in which digital transformation is already underway. The grant allows the research team to relate the research findings to the goals of the “Tallinn Declaration on E-Government” signed by all European countries. Up to date news about the project’s progress are posted on Twitter. The main goal of Co-VAL is to discover, analyse, and provide policy recommendations for transformative strategies that integrate the co-creation of value in public administrations. The project aims to accomplish these objectives by conducting research on the paradigm shift from the traditional top-down model to demand and bottom-up driven models when citizens, civil servants, private, and third sector organizations voluntarily participate in the development of transformative innovations addressing changing needs and social problems. Co-VAL will push the boundaries of both research and practice by providing: i) a comprehensive and holistic theoretical framework for understanding value co-creation in public services from a service-dominant logic and a service innovation multiagent framework, ii) measurement and monitoring for transformations in the public sector by using both existing data and new metrics (large-scale survey), iii) investigation on 4 public-service-related co-creation areas of public sector transformation: digital transformation (including open platforms, big data, and digital service delivery), service design (including service blue-printing), government living labs, and innovative structural relationships (public-private innovation networks and social innovation), and iv) generation of sustainable impacts in public administration policy and practice by delivering actionable policy recommendations that build on the research findings, by tracking and monitoring how governments’ pilot projects and actions, and by facilitating peer to peer knowledge exchange to facilitate implementation. Co-VAL is a consortium of 13 teams from 11 EU countries formed by leading experts in public administration, co-creation and open governance, digital economy and service innovation. The consortium is organised to co-work with stakeholders representing central, regional and local administrations. Die öffentliche Verwaltung hat eine lange Phase des sogenannten New Public Management hinter sich – ein Paradigma, nach dem sich der öffentliche Sektor mehr wie der private Sektor verhalten soll. Budgetanreize wurden so gesetzt, dass viele Aufgaben, die nicht als Kernkompetenz der Verwaltung angesehen wurden an Dritte ausgelagert wurden. Es fand eine Dezentralisierung der Aufgaben statt. Das Resultat dieser Reformwelle war: tiefe Silos und wenig Datenteilung über Behördengrenzen hinweg, sowie die Reduzierung der Kompetenzen und Ressourcen im IT-Bereich. Das erste Team wurde vor fünf Jahren in Großbritannien gegründet: Der britische Government Digital Service (GDS), ursprünglich dafür gegründet wurde, um die überalterte Gov.UK-Webseite zu überholen, hat sich im Laufe seiner Tätigkeit zu einem Transformationsprojekt entwickelt, das mit Hilfe von UX-Designern oder auch Storytellern gemeinsam mit den Verwaltungsbeamten in den Behörden interne Prozesse neu überdenkt, anstatt nur das äußere Erscheinungsbild zu modernisieren. Das Ziel ist es Onlineprodukte der öffentlichen Verwaltung anzubieten, die in ihrer Qualität und Umgang mit Produkten externer Provider im privaten Sektor mithalten können in dem sie einfach zu verwenden sind, in einfach verständlicher Sprache für jeden zugänglich sind und generell den Frustrationslevel der Verwaltungsakte reduziert. In den USA wurden unter Präsident Obama gleich zwei Teams gegründet: (1) U.S. Digital Service: ein ‚Feuerwehr’-Team, dass sich vor allem mit der Wiederherstellung des gescheiterten Onlinemarktplatzes zum Verkauf von Krankenversicherungen beschäftigt hat und danach als Stabstelle dem Weißen Haus zugeordnet wurde. (2) 18F (ursprünglich zu finden an der Straßenecke der 18th und F Street in Washington, DC) ein sogenannter ‚services company and product incubator’, der sich auf die Einführung von agiler Softwareentwicklung spezialisiert und als interner IT-Dienstleister die Behörden auf neue IT-Akquisitionsformen vorbereitet. Beide Teams wurden nach dem ursprünglichen GDS-Vorbild modelliert und haben zusätzlich Ableger in großen Ministerien gegründet, wie dem Verteidigungs-, Umwelt- oder Heimatschutzministerium. Ein ähnliches Team ist in Australien mit der Digital Transformation Agency (DTA) gegründet worden um Online-Dienstleistungen klarer, einfacher, und schneller anbieten zu können. Auch hier ist der Fokus darauf was Bürger benötigen, wie deren Onlineverhalten ist, und wie sich die öffentliche Verwaltung diesen Herausforderungen stellen kann. Italiens ehemaliger Premierminister Renzi hat ebenfalls einen IT-Inkubator auf den Weg gebracht und für deren Leitung einen italienischen Landsmann der derzeit einer der Vizepräsidenten von Amazon ist, eingestellt. Um da s italienische Team Digitale aufzubauen pendelt Diego Piacentini zwischen Seattle und Rom und befindet sich in der Rekrutierungsphase einer Vielzahl von IT-Experten. Ein besonderes Merkmal das Team Digitale ist die starke Außenorientierung. Das im Verhältnis sehr kleine Team (25 Mitglieder) hat zwei Plattformen aufgebaut: Eine Designer– und eine Developerplattform, auf der sowohl externe Programmierer dabei helfen neue Produkte zu verbessern, aber auch gleichzeitig Designer und Ingenieure in den Behörden bereits einmal entwickelte Ideen und Tools wiederverwenden können. Was ist all diesen Teams gemeinsam: Sie sind explizit in Form von IT-Inkubatoren in der Bürokratie aufgestellt. Oftmals sind diese Teams außerhalb der traditionellen CIO-Organisation angesiedelt, so dass sie sich inhaltlich nicht mit der Wartung und Instandhaltung der bestehenden IT-Infrastruktur beschäftigen. Sie sind mit Vollmachten und Budgets ausgestattet, die es ihnen erlaubt IT-Ingenieure aus dem privaten Sektor zu rekrutieren und dadurch Kompetenzen und Erfahrungen in den öffentlichen Sektor einzuführen, die bisher vor allem auf externe IT-Dienstleister beschränkt waren. Diese Teams arbeiten teilweise mit innovativen HR-Methoden, sowohl im Bereich der Rekrutierung als auch in den flexiblen Anstellungsoptionen, die es für IT-Ingenieure und Softwareentwickler leichtmacht, für kürzere Zeiträume einzusteigen mit der Option wieder in ihre bisherigen Jobs zurückzukehren. Beispielsweise nutzt die US-Regierung eine flexible HR Policy, die Ingenieure aus Silicon Valley von Firmen wie Google oder Twitter für sogenannten „Tour of Duty“-Anstellungen nach Washington bringt, die zwischen zwei Monaten und zwei Jahren liegen können. Die Motivation der Ingenieure ist offensichtlich nicht das weitaus geringere Gehalt im öffentlichen Dienst, sondern eine prosoziale Motivation ihrem Land kurzfristig mit ihren Fähigkeiten aushelfen zu können und dadurch eine breite Wirkung auf die Verbesserung der Zugangsmöglichkeiten zu öffentlichen Onlinediensten für die gesamte Bevölkerung zu haben. Die Start-up-Kultur mit breiter Mitbestimmung, flexiblen Arbeitszeiten, einer Just do it-Mentalität und kurzen Entwicklungszyklen steht allerdings klar im Konflikt mit der Top-down-Hierarchie der öffentlichen Verwaltung. Die Herausforderung in diesen IT Start-ups in der Verwaltung bleibt die Schwierigkeit neue Technologien und Arbeitsweisen in die Bürokratie zu bringen und den Bedürfnissen der öffentlichen Verwaltung anzupassen. Oftmals kommt es zu einem Aufeinanderprallen der Kulturen: Externe werden geringschätzig als „Kids in Shorts“ bezeichnet, denen es oftmals an Verständnis für die gewachsenen Strukturen, die negativen Anreize der Bürokratie und einem generellen Verständnis für die bindende Gewalt eines Verwaltungsaktes fehlt. Jedoch haben die bisherigen Erfahrungen sehr innovative digitale Transformationen hervorgebracht, dazu gehört beispielsweise die Blue Button-Initiative des Department of Veterans Affairs, mit deren Hilfe sich Kriegsveteranen in allen US-Bundesstaaten ihre Gesundheitsakten herunterladen können oder die Vereinfachung des Immigrationsprozesses von 18 Webseiten auf eine Seite. Kleinere Veränderungen wie die Vereinfachung ansonsten sperriger Verwaltungsakte, die im Amtsdeutsch beschrieben sind und oftmals Dienste von Anwälte, oder anderen Experten verlangen, können nun unkompliziert von zuhause aus durchgeführt werden und haben dadurch die Interaktion zwischen Bürgern und der Verwaltung verbessert. Alle Teams müssen sich noch etablieren und über die Zeit wird sich Zeigen, ob die Bürokratie digitale Innovationen mit Hilfe von IT-Inkubatoren oder digitalen Agenturen aufnehmen kann. Auch in Deutschland wurde vor dem Wahlkampf der Bundestagswahl in 2017 viel darüber debattiert wurde, ob es ein Digitalisierungsministerium geben soll, z.B. in Form einer Digitalagentur, die im Bundeskanzleramt angesiedelt sein könnte. Alle Forschungsergebnisse deuten daraufhin, dass besonders in Ländern mit einer langen Digitalisierungstradition, die Systeme und Strukturen so komplex geworden sind, dass es notwendig ist, aus dem Alltag derjenigen, die diese Systeme am Laufen halten müssen, herauszutreten und mit komplett neuen Kapazitäten und Ressourcen Digitalisierung neuzudenken. Die Verwaltung ist in Deutschland ‚by design’ dezentral aufgebaut, um einen hohen Grad Rechenschaft und Haftung zu schaffen und so die Zentralisierung einer politischen Macht wie im Dritten reich zu vermeiden. Dieses Ressortprinzip führt dazu, dass Entscheidungen über IT-Maßnahmen dezentral getroffen werden. Zusammen mit dem Föderalismus entsteht dadurch Entscheidungsfreiheit auf mehreren Ebenen – in jedem einzelnen Bundesministerium, auf Landesebene, bis hin zu den Kommunen. Um grundlegende Veränderungen und Fortschritte in der Digitalisierung der öffentlichen Verwaltung anzustoßen, kann deshalb eine prominent im Bundeskanzleramt angesiedelte Digitalagentur mit einem Innovationslaborcharakter ein Weg sein, um die oben beschriebenen Prinzipien zu erhalten, aber gleichzeitig Modellcharakter zu haben. Dadurch können innovative digitale Kompetenzen mit Designkenntnissen gebündelt werden, die so in der öffentlichen Verwaltung nicht ausgebildet sind und bisher vor allem im privaten Sektor angesiedelt sind. Was ist dafür notwendig: Eine politische Entscheidung gekoppelt ein entsprechendes Budget, die Freiheit die besten Kräfte für den Job zu rekrutieren, hohe Flexibilität IT-Akquisitionsentscheidungen zu treffen, um so auch kleinen Start-ups mit innovative Ideen und Produkten den Zugang zur öffentlichen Verwaltung zu ermöglichen und kontinuierliches politisches Backup für das Team, so dass es Zeit und Kompetenzen hat Transformationen herbeizuführen. Professor Dr. Ines Mergel ist Professorin für Public Administration an der Universität Konstanz wo sie zu Themen der digitalen Transformation der öffentlichen Verwaltung forscht und lehrt. 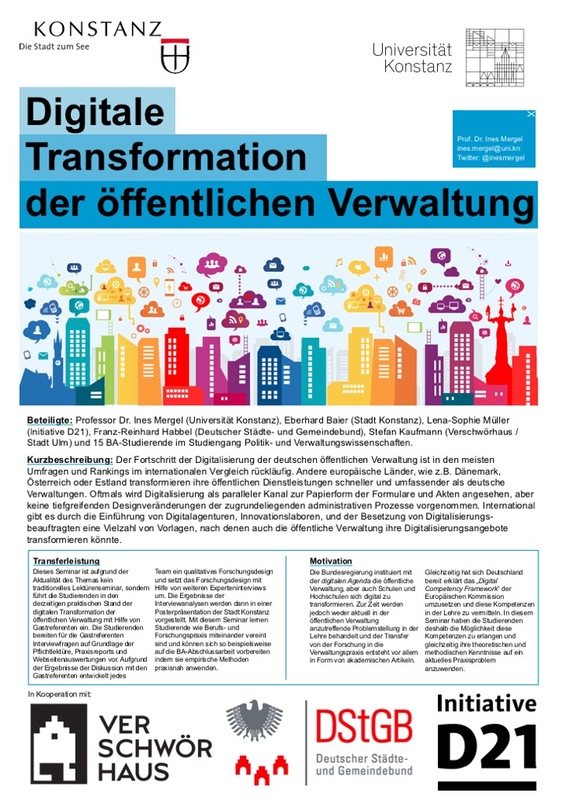 Erste Ergebnisse von Professor Mergels Forschung zu Digitalen Service Teams wurde in einem Report IBM – Center for the Business of Government mit dem Titel „Digital Service Teams: Challenges and Recommendations for Government” veröffentlicht.